All transactions are safe and secure with a reliable history in online purchasing behind each of our associates. Buy the CSI Logo t-shirt to own CSI clothing and merchandise. 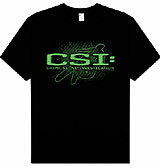 These officially licensed dark CSI t-shirts feature a large version of the TV show's logo printed in green ink on the front chest. Behind the CSI: Crime Scene Investigation logo, is a sketchy outline of a body. This classic CSI Las Vegas t-shirt is a must have for fans of the hit television show. The tee is made of 100% cotton, which will provide the necessary comfort needed to work a crime scene. In addition to the CSI Logo tee above, browse the CSI Clothing Gallery for more apparel like men's and women's clothes, kids shirts or hoodies.